We’ve all seen click bait! Clever use of words and specific turns of phrase that propel someone to slide their cursor over to that hyperlink. They just gotta see what this is all about! Most of the time the hyperbole works. Most of the time the hyperbole disappoints! My mind isn’t blown. I am not shocked! I am left thinking to myself, “was that it?” But I clicked. As we learned in class, words work. In the short amount of screen real estate online headings are allotted, a little bit of craft (and trickery) is used to get the viewer to click. We were given an assignment to re-work for online -physical copies of The News Journal’s front page Living section showing an enormous vintage photo of Frank Sinatra carving a turkey. The below-photo headline in giant font read TURKEY MY WAY. The gist of the article is how to take charge at Thanksgiving. There were tips on what size to buy and how to prepare the overall meal for (and what is assumed to be a stressful) family reunion. Toward the end of the article, a short account of a Thanksgiving holiday Sinatra spent alone at a favorite Italian restaurant, along with samples of Paul Anka’s lyrics for My Way, appeared in order to tie Sinatra to the article. Sinatra was the hook, but the article really has little to do about Old Blue Eyes. 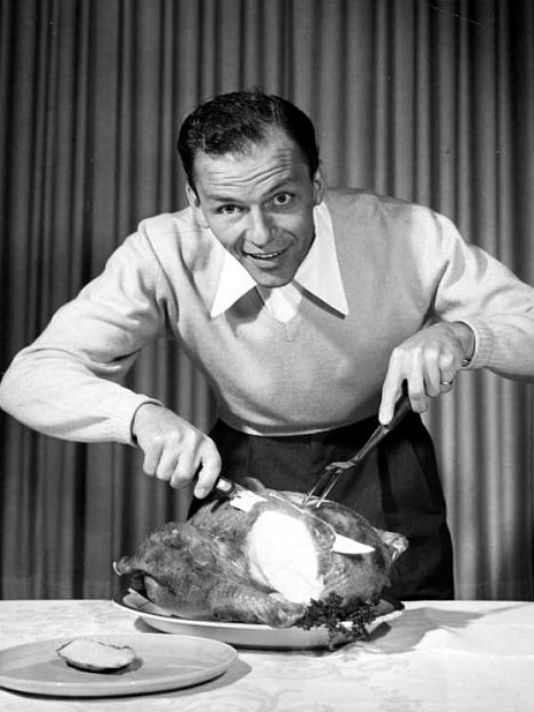 The News Journal’s online version found on their web site Delaware Online used a different headline: Take A cue from Sinatra – plan Thanksgiving your way. Note to self: The print presentation of this article is way different than the straightforward online presentation. So if I worked for Buzz Feed, Huffington Post (who did some dastardly baiting about chickens), or even The Weather Channel (who has sadly discovered click bait and uses it with regular frequency on Facebook) and I was tasked to promote on social media, such as Facebook and Twitter, what teaser headline might I use for this same story? So here are some ideas! Don’t be a turkey tyrant! Be a CEO of your Thanksgiving Board Meeting! But what if I was required to use the Sinatra photo in the lead? Accidents will happen! Don’t let your #Thanksgiving meal become a slug fest! Baby won’t you please come home? When there’s 30 lb bird in the oven and no one shows up! Don’t ever be afraid to go home! Enjoy your Turkey Day and Aunt Sally too! Oh! Look at me now! Preparing your first #Thanksgiving meal? No worries! Read how! One for my baby (and one for the road)! Cook enough #turkey for the meal and leftovers too! The trick with online headlines is to capture that seven-seconds of human attention span. Exaggeration is par for the course. The full-title of the actual article (see my post on what Huffington Post did to chickens) is rarely used. Online content craves engagement. You have to see it first before you can like it, retweet it, share it or give it a thumbs up, heart or star. If they miss you at the news stand, they’re sure to grab you online! You’ve just got to read this! You won’t believe what this guy did! It will blow your mind! Honest! According to the Center for Food Integrity, an organization that measures people’s attitudes about food and food related topics, 1968 was a watershed year in the decline of ordinary Americans’ capacity to trust authority figures, such as their government. Today, people prefer to receive their news from sources that align with their personal belief systems. Hence, Republicans might opt to get their news from Fox or the Wall Street Journal, Democrats from MSNBC or The New York Times. People want to sing with their own choir. It’s affirming, isn’t it, to surround ourselves with people who think and feel the same way. The internet has enabled these comforting communities to proliferate. As a journalist, I’ve been trained to consider as many voices as I can before penning a story or forming my own personal opinion. I am proud that my respective news feeds are a mixed bag. I think it’s healthy. It challenges me to use my noodle. So, as an agricultural communicator, quite a bit of anti-agriculture sentiment shows up in my social media news feed. This recent piece from the Huffington Post caught my eye on Facebook. As you can see, I made a comment. Pro agriculture voices, even fair voices, are rare in social media. 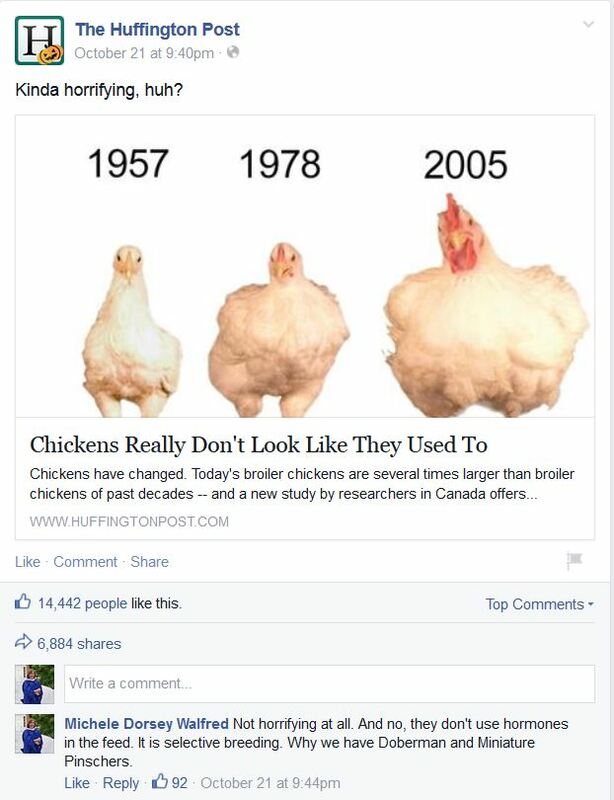 And to be fair, the article as originally posted on Huffington’s website does not mention “horrifying.” The article simply references a study which confirmed the growth in chicken size is the result of selective breeding. The truly horrifying aspect of this story was how it was fed to Facebook, baiting the reader with the intro “Kinda horrifying, huh?” as a unique social media lead. Why do that? Why, to provoke a controversial conversation! Click bait. Engagement bait. The photo alludes to something scientifically sinister going on in the poultry farming community. As evidence by the large number of comments and shares, few read the article. They connected “horrifying” to the image and that was enough. Huffington Post must be very pleased. 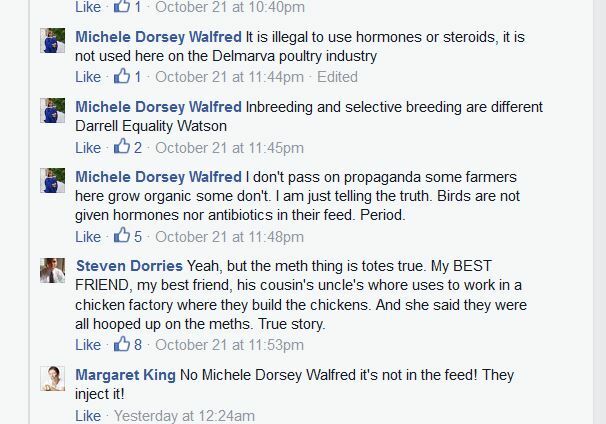 My comment, which correctly states that hormones are illegal in the poultry industry is an undeniable fact. Antibiotics are also not routinely added, and are only administered if chickens present signs of contagion, and even then, are given in such a manner that do not make their way into the meat of the bird. And like dogs and cats, selective breeding occurs in the animal kingdom- sometimes to get a pointed, angular face on a Siamese cat, a larger size on a dog, curlier fur, a faster horse, whatever. Man has done this with chickens too. Ag scare tactics proliferate in social media. Men in hazmats suits as they harvest corn— so obviously staged or Photoshopped, it’s ridiculous. Another common trope is the mad scientist, hiding behind a medical mask, hypodermic needle in hand, ready to insert unknown substances into our food. Social media audiences share these images willingly as fact, without doing any due diligence. A lie, repeated often enough, becomes a new truth. Any fair discussion or debate should include differing opinions. On this occasion, I decided to say something. I spoke up because I was confident in the facts. How naive of me to think facts mattered. To paraphrase Col. Jessup, Jack Nicholson’s character in A Few Good Men, most HuffPo Facebook followers (I won’t call them ‘readers’) couldn’t handle the truth. They sure as heck didn’t want to hear it from the likes of me, an obvious propagandist! They wanted to hear and repeat “their” truth. How do you talk to these people on social media? 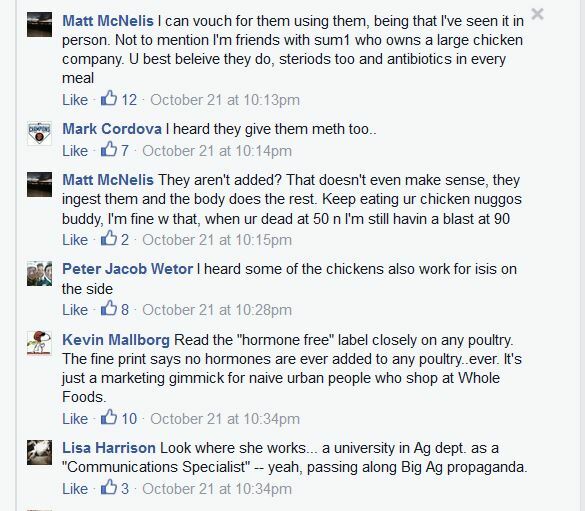 Matt’s comments at the top vouch for the poultry industry using banned substances. Matt doesn’t make his workplace, profession or education publicly known. He just knows some people who know some people, and these people, these evil farmers are never named. No location. No proof. Just his tremendously articulate statement of fact. We are not to question Matt. Me on the other hand, I am an open book. My education, my profession and workplace at a respected college of agriculture is something that clearly disqualifies me, according to Lisa Harrison who appears at the bottom. Look where I work, she alerts the feed! Indeed, I’m in the bag – part of the vast conspiracy to perpetuate poultry propaganda on the American public. And the conversation went on and on like that. Some learned souls clearly knew their facts, smart alecs had their moment, and the vast majority fully convinced that chicken in our diet is unhealthy and immoral. It was hard not to type what I really wanted to say. My blood pressure rose. I could have gone on. Hey, if you want to eat vegan, that’s fine with me. Go organic! Whoohoo! We support that at the college too! Our Cooperative Extension experts teach people to farm better and employ natural controls. Fruits and vegetables! Hey, we grow them here in Delaware. Love ’em! We show farmers how to use less pesticides, herbicides and fungicides. I could have shored up my unbiased bona fides, but I doubt that would have held any sway. I am not against their choices! My daughter lives in New York City and she and her husband buy and eat almost 100 percent organic. I don’t recognize a single food brand in their kitchen. But when I am there, I eat their food and it is all fine. Really, it’s all fine! And that is precisely the point. We’re allowed to have choices. Don’t demonize those who want to eat chicken or grow chicken for a living, just because you don’t want to eat it. Sure, there are a lot of bad actors in any profession – but I’ve met many poultry family farmers, and yes, these birds are raised for food, but while under their care, they are well-treated. If a bird gets sick, farmers do what they need to do to keep the disease in check – same as you might do for your children or the family pet. Farmers continually go to classes to learn how to do it better. So I get upset when they are portrayed erroneously in the intelligentsia of the social media comment world. Don’t make this stuff up! Do your due diligence! They’d rather listen to anonymous voices than science, or institutions dedicated to providing unbiased research. This thread went on quite a while. Other comment threads on the article were similar, the vast majority of expert voices knew somebody who knew someone, and armed with their “Because I say so” facts, condemned the industry as a whole. They didn’t want to entertain anything different from what they believed. Case closed! Virtually, it was hard to hold my tongue. But aware of who I represent I said my peace and checked future comments at the gate of utter frustration. It’s hard to measure whether my attempt at honesty and reason had any effect. Facebook doesn’t offer those insights! I realized early on no amount of chatter or credential was going to make a dent in minds long since made up. Minds closed to entertaining any real discussion. Minds who wanted only to obtain information from other like-minded minds. I let them ramble on. I ignored my mounting red notification numbers. I gave them the last word – for surely, they’d insist upon it anyway. This blog was created as an assignment for the University of Delaware Social Media Strategy Certificate Program - a comprehensive and intense four-month immersion into all things related to social media, best-use practices, and marketing that I took in the fall of 2014. My classmates and I each created a blog. When class concluded, I kept the blog going! Opinions and posts expressed are solely my own. Another one bit the dust today. Hate these fake accounts! Every one I have reported has been taken down. Fake men in uniform, selfie overload, puppies and kittens. Really?